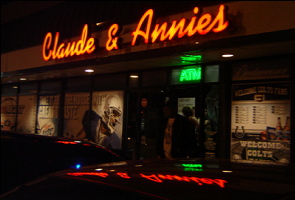 Claude & Annie's Girl School location is Indianapolis's south and west sides best destination for Food, Fun & Spirits. We can be found just north of US 40 at the Southeast corner of Girls School and Morris on Indy's Southwest side. 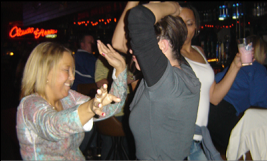 The atmosphere is bright and cheery and features a large selection of digital music on the Bose Touch Tunes jukebox, and Karaoke on Friday and Saturday nights. 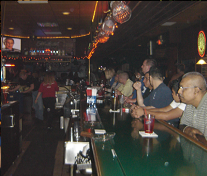 You will find many things to do here, like play some pool on 1 of our 5 tables, or shoot some darts on the Medalist soft tip machines, all while you enjoy your favorite menu item or cool off with a liquid refreshment. 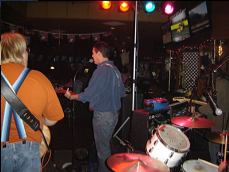 Check out our menus, specials and calendar and then drop by for some Food, Fun & Spirits. Remember, you must be 21 years of age to enter this Claude & Annie's location. Copyright (C) 2010 Claude & Annie's. All rights reserved. 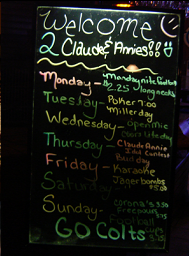 Visit Claude & Annie's in Fishers!